The colder it gets during the winter months, the more time I want to spend my time indoors, preferably by a fire or something along those lines. And while we don’t currently have a fireplace in our apartment (or at the studio), I figured I tried to cozy up with some DIY projects instead. 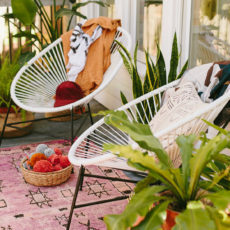 And since one of the easiest things to make when cozied up under said fire is a pom pom, this week’s DIY roundup is focused on these cozy AF little thingys. All you need a tiny plastic tool or scrap cardboard, along with some yarn and you’re in business. 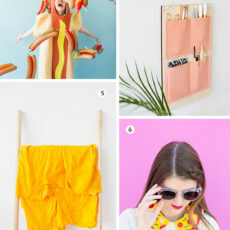 Here are 7 pom pom DIYs to try this weekend! Anyone else noticing the pom pom trend still going strong in the new year? I mean there’s definitely a way to do it right and then there’s all those over-the-top fails that we’d all like to forget about as quickly as possible. None of those were included in this roundup, of course. P.S. We made it through the first week of 2018! How are you feeling so far this year?! < previous postUltra Violet: What Do You Think About the 2018 Pantone Color of the Year? I love the pom pom top. I want to make that but i feel like i would screw it up. 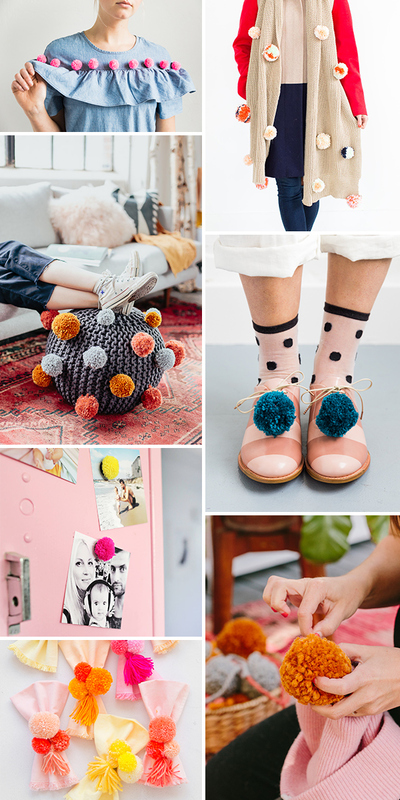 I love that pom poms are so bright and cheerful, the perfect thing for grey winter days! Love the scarf idea! 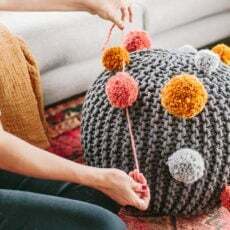 Definitely loving that pom pom ottoman! So cute!! Glad to hear that Pink Pineapple and Baiba. I will try it at home because I like the pom pom top.